What’s Ireland's big problem with big families? As larger families become increasingly rare, parents with bigger broods say they are often the target of hurtful, judgmental comments directed at their kids. Julie Brennan with her daughters Grace (10), Charlotte (7), Sophie (6) and Emily (4). Twins Siobhan and Emma (2), Brian (7 months) and Rachel (8) with mum Becky Dore. Photo: Frank Mc Grath. Shocking? Yes, but these are some real examples of offensive comments made to the mothers of large families, usually from complete strangers — and, ironically, in a society where just 40 or 50 years ago, families with seven or more children were a normal part of daily life. But things have changed radically, as family size steadily reduces. In 1962, some 2,000 mothers had 10 or more children — by 1998, that figure had dropped to just 55. In 1971 there were some 15,000 families with six or more children — these days that’s plummeted to just 3,000. With the average family now clocking in at just 1.4 children, big broods are an increasingly unusual sight in Ireland, so much so, in fact, that mothers with several children have learned to expect a barrage of personal questions and intrusive comments whenever they’re out and about with the kids. 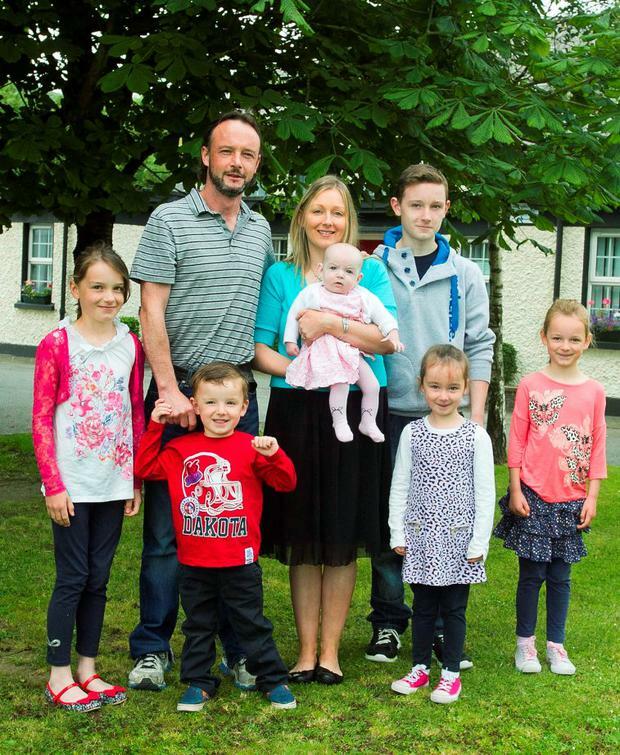 “People think they can say anything to you,” says Wicklow mum Karen O’Connell, who has six children aged from five months to 14 years of age. “It’s ‘Why’re you doing this? What could make you want to have six children? “I’d get comments like: ‘Don’t you know how they’re made?’ I’d never ask someone why they only have one or two children”. Karen had always wanted a large family and had her first child at 20. But now in her mid-30s, Karen says she feels complete strangers assume the right to make intimate comments about her family — to such an extent that she tries to do the grocery shopping when she doesn’t have to bring all the children. “I don’t want to be in the supermarket with all six of them; I know I’d probably get looks and I’d be conscious of having six and trying to keep them all under control,” she says. The observations are often subtly disapproving or even judgemental — it may be insinuated that a couple’s big family is the result of their own poor planning, is costing the taxpayer money or that the children will lose out on the opportunities available to those in much smaller family units. Businesswoman and mother of five, Julie Brennan knows all about it. Not only does she get comments about the size of her family but also the fact that she has all girls — Grace (10) Charlotte (7) Sophie (6) and Emily (4) — attracts attention. “I’ve had people saying ‘are you mad?’ adding that they wouldn’t go for any more than two,” says Brennan, from Delgany. 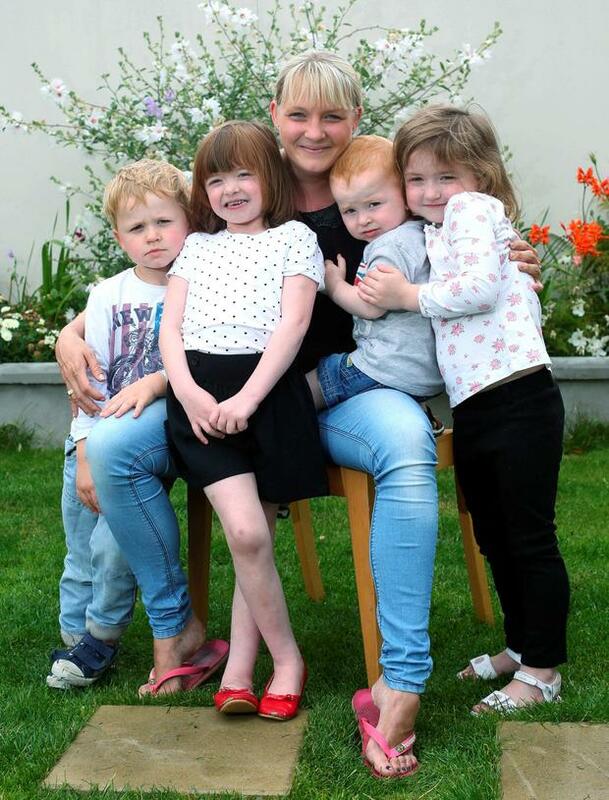 There’s an element of stigma around having a large family these days, believes Lucinda Carty, who lives with her husband and four children aged seven, five, four and nearly two, in Stillorgan. The attention was especially noticeable when she was pregnant with her third and fourth children. Carty recalls being repeatedly asked if these pregnancies were deliberate. “Complete strangers will approach me. I don’t know why they think they can make comments like this. I found when I was pregnant that people were very fast to give an unasked-for opinion or make jokes,” she says. However, beneath the jokes and the supposed admiration for her bravery, Carty suspects a very real undertone of disapproval. “It really annoys me. I consider my kids my greatest achievement and I feel people are slagging off what I consider to be my greatest achievement. I think that when Irish people don’t understand something they take the p*** out of it,” she says. People will even wonder aloud whether her children will have the same opportunities they’d have had in a smaller family, says Carty. “I’ve got that once or twice, and my view is that you start saving earlier. All my kids will have the opportunities they need. I think people today are too busy giving children everything they want, whereas mine have everything they need. “I don’t think anyone should have to defend having several children, but I’ve been put in the position of defending my choice to have four children. “The comments people feel they can make are bonkers. I smile and laugh it off but it does affect you; it does get to you a bit sometimes.” None of this comes as any great surprise to Dr Niamh Hourigan, head of the Department of Sociology at UCC, author of Rulebreakers, published earlier this year — and herself the oldest child in a family of seven. Economic constraints, changing attitudes to child-rearing, changes to the structure of the State Children’s Allowance, and the decline of the Catholic church, have all played a part in the public’s changing attitude to large families,she believes. When writing her book, Although her book centred on corruption in Ireland, Hourigan researched family relationships and attitudes to family over the years in Ireland. “I could see elements of this disapproval coming up,” she says, adding that while historically, attitudes to large families in Ireland were more positive than in other European countries, things have definitely changed now. “In 2011 research on attitudes to family formation showed Irish people wanted to have more children than they had — but that they could not have them, often for financial reasons, so two children were becoming the norm. “This was very often dictated by financial constraints. What was clear was that economic factors were becoming more and more significant in deciding family size. “I’d say there’s an element of envy, because so many people feel they cannot afford a large family,” she says. Increasingly, she adds, a large family is becoming almost exclusively the preserve of the affluent. Furthermore, she points out, changes to the structure of the Children’s Allowance Scheme from 2012 meant there was less money for the third child onwards — in itself a disincentive. “Attitudes to parenting have changed significantly in recent decades,” she points out. Popular parenting books now place much focus on giving a child plenty of individual attention. “This is creating a vision of one-on-one parenting— and if you’re a parent who buys into that, you may look at someone with six or seven children and ask how can they parent them adequately? “I think most people will recognise that there’s a different approach to parenting now,” she says adding that, rightly or wrongly, there can be a suspicion that the parents of large families are unable to give children the recommended level of attention. “The growth of Helicopter Parenting, and concerns around child safety and stranger danger have led to the perception that children need to be monitored all the time. Lastly, points out Hourigan, our historic approval of large families was undoubtedly linked to the dominance of Catholicism in our culture. “As Ireland becomes more secularised, there is no question that this is also impacting on attitudes to the family,” she explains. Laura Haugh, of MummyPages.ie, says mums with four or more children “are frequently met with shock and comments as to whether they were all planned, or why they just simply didn’t watch television in the evenings. It really beggars belief that people think it’s socially acceptable to pass these remarks, often upsetting the mum in the firing line. Haugh points to Australian blogger Annie Nolan, who got so fed up with the daily barrage of questions and comments that she attached a kind of ‘Frequently Asked Questions’ poster to each of her twin girls as they sat in their buggy. “The decision for a couple to have a family in the first place and then to add further siblings to their family unit is deeply personal. Becky Dore, from Greystones in Co Wicklow, is planning to have her fifth child next year. She says she’s already bracing herself for the comments. “I think people don’t mean it, but once you go over three kids they think it’s crazy”. She and her husband made a conscious choice to have a large family, she says, but when she goes to the supermarket with her children, she has to prepare herself for a slew of personal comments as she works through the aisles. What people don’t realise, she observes, is that “you’ve already been the target of similar comments in the previous supermarket aisle. I will already have been asked how I can do it and how wrecked I must be. “It’s like a shock to people. It’s something that is not normal in Ireland to see larger families any more. “Yet people feel they can come up to you and comment about your choices instead of talking about how healthy and happy the children look, and that can be very tiring. “I would rather someone would tell me that the children are lovely than how tired or busy I must be. “I know that when I’m pregnant with my fifth child I’ll feel awkward and that, instead of feeling happy and contented that the pregnancy is going well, I’ll be a bit uncomfortable. Amy Farrell knows all about the comments people make to the mothers of large families. With five beautiful sons - aged nine, seven and four as well as 18-month-old twins - the 35-year-old from Delgany, Co Wicklow, is a veteran of the 'pass-remarkable' habits of the common-or-garden bystander. "I have had that comment from men and women who are complete strangers to me. "However, on one occasion the remark was made by an older man in his 60s who approached me in a supermarket. I felt quite creeped out. "I've also been asked if I know how expensive it is to rear children - almost as if I was being told off for having them! This kind of thing happens usually when I am out with all of the kids. "I got married at 24 because I wanted to start my family at a young age," she says, adding that she believes people often don't mean to offend. "I also get compliments from people who are nostalgic about the fact that there are fewer large families than there used to be. "However, when my husband and I are out with the children we feel like a bit of a circus! People will look at me with the five boys. "The average family now is two children and anything outside of that attracts attention. Sometimes I feel self-conscious about it," she says, adding that she also often gets questions about how disappointed she is not to have a girl. "At one stage so many people were going on at me about having a girl that I really felt under pressure to have one. I feel there is sometimes a negative side to the comments. "It's no-one else's business whether I have boys, girls or aliens - or how many of them I have. We support our children and we do everything for them and it's our business."